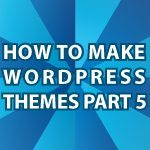 In my previous WordPress Theme Tutorial I showed you all the HTML that goes into a WordPress Theme. In this part of the video tutorial I’ll show you all of the CSS code that you need to style the theme. If you don’t understand CSS check out this CSS Layout Tutorial. You can also learn more about the menu used here CSS Layouts and Menu Tutorial. Leave any questions of comments below. Hello again. What do you think is the better method to use in developing themes in wordpress, is it using conditional tags or using the template hieararchy? The answer is you need both. I normally use different templates based on conditional tags. Does that answer your question? where are the pt6 and pt7 i love ur tutorials pls send me the link. By the Thanks you r doing great. You can find everything in order on this one page WordPress How To. First I would like to say I love your videos. I followed every part of the key health care site tutorial… went through line by line and I don’t seem to be able to get the index to pick up the style sheets. I’m really just trying to get on to converting it to word press which I believe is the tutorial I’m on. I have 8 years coding experience. Ive never had this problem. I went into Dreamweaver and deleted the style sheets then reattached them. When that didn’t work I copied every bit of the code you provided and pasted it. I don’t see any errors. The only style that shows up is the background body color. Thank you 🙂 One odd thing that may be messing everything up is that you have to replace the back quotes with regular quotes if you copied and pasted directly from my site. The only other thing I can think of is that there may be a permissions problem? I’m not sure. I just checked and everything is still working on my end so I’m guessing it is something little. Thank you 🙂 I hope you find the site useful. I have about 80 WordPress tutorials in general. I list most of them here in order WordPress How To. Thanks for checking out my little website!